Sixteen of the 19 gold cup winners performed at this year’s Gold Cup Recital in Ephraim on March 18. 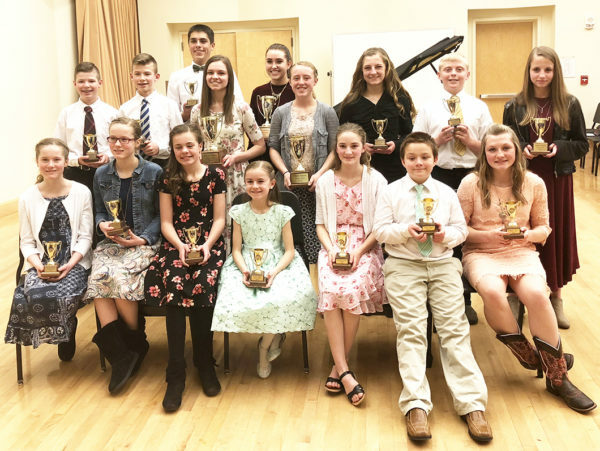 EPHRAIM—Sixteen young piano players performed at the annual Gold Cup Recital put on by the Central Utah Piano area of the Utah Federation of Music Clubs. The recital showcases the accomplishments of each student, and this year’s recital was at the Snow College Eccles Center on March 18. Three students earned their fourth gold cup (60 points) this year: Rylee McKay, Nicole Nelson and Kalani Wallace. Two students earned their second gold cup (30 points): Phoebe Gordon and Preston Thompson. Fourteen students earned their first gold cup (15 points): Brinley Bailey, Allie Bridges, Jacob Cox, Joshua Cox, Abigail Gordon, Bryson Jaussi, Whitney Larson, Amber Lee, Juliana Nelson, Rachel Nelson, Samantha Seely, Adam Thomas, Hyrum Tippetts, Madison Wonhington. Sixteen of the 19 gold cup winners performed a piece at this year’s recital. To earn a gold cup, students play solo pieces at a concerto festival and a piano solo festival, where they earn points. A superior rating awards them five points. Earning a gold cup takes a minimum of three years of superior ratings for a total of 15 points. Additional cups are then awarded for each additional 15 points earned. The teachers of this year’s gold cup winners are Brandy Jarman of Fairview, Debbie McKay of Mt. Pleasant and of Ephraim Barbara Dalene, Lisa Frame, Mary Hood, Ardith Peterson and Sylvia Wendel. All of the teachers are members of the Central Utah Piano area of the Utah Federation of Music Clubs, which is affiliated with National Federation of Music Clubs.